May 5 , by Katrina. 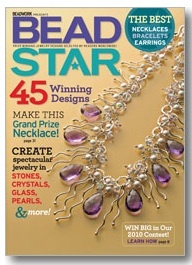 If you have not yet submitted a design for Bead Star, you are in luck, as the deadline has been extended to May 10, 2010. You could be the next winner! Winning designs are showcased in the magazine, and the grand prize winner receives an all-expense paid trip to Bead Fest Santa Fe, plus a grand prize valued at up to $1000. What makes this even better is that the winning designs will be auctioned of to benefit American Heart Association’s Women’s Heart Health Initiative.